Can I commission an original painting? Yes, I love doing commissions and helping someone’s creative vision become a reality. However, I do commissions on a first-come-first-served basis and it depends on my current travel schedule. If you are interesting in commissioning me for a special piece, please contact me here. You can purchase my artwork through my Etsy shop. If you don’t see what you’re looking for there, you can contact me here. All sales are final except in certain situations. My goal is for you to be completely happy with the final product received, so please read item descriptions carefully and take note of dimensions, colors, and details before making your purchase. I try my best to accurately represent my work in digital images, but some color variance between digital images and artwork in real life is unavoidable. Do you host workshops or classes? Yes, I would be thrilled to host a Bible journaling workshop or art class for your church, Bible study, or event! Please contact me here for booking. For information on upcoming classes, please sign up for my [email list]. Yes, you are welcome to share my artwork on your blog or website but please give credit where credit is due, and you may not alter or reproduce my artwork or images under any circumstances. Drawing and painting has always been a favorite pastime. I took an art class for a few years as a kid and worked mostly with charcoal and chalk pastels at that time. Throughout high school and college, I took les and less time to be creative until, after graduating from college, I found myself starving for a creative outlet. It was at that point that I started a 365-day art project I called “Art Everyday” in which I drew or painted something everyday for a year. This project gave me license to experiment, learn new techniques, and play around with different mediums. It was through this everyday project that I found my love for acrylic paint, abstract textures, geometric design, and botanicals. For my fine art pieces, I use mostly acrylic paint on canvas. For some of my hand-lettering pieces, I use both watercolor and acrylic paint. For Bible journaling, I usually use a combination of acrylic paint and archival-quality artist’s pens. No, I am not a graphic designer. Can you give me tips for Bible journaling? Yes, please see my Bible Journaling page journaling tips and tutorials. If you would like to book me for a Bible journaling class, please contact me here. You can view my portfolio by clicking the portfolio link in the above menu. 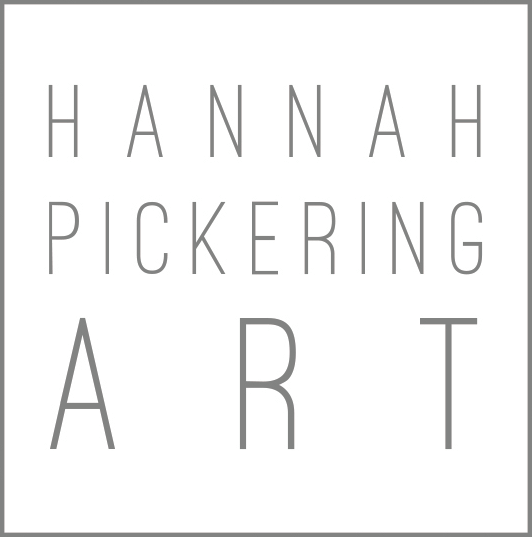 PLEASE NOTE THAT HANNAH PICKERING RETAINS ALL RIGHTS TO ALL ARTWORK, EVEN THOSE OF SOLD & COMMISSIONED ORIGINAL PAINTINGS. HANNAH RETAINS THE RIGHT TO MAKE REPRODUCTIONS OF ANY AND ALL ARTWORK SHE CREATE UNLESS THE COLLECTOR HAS PURCHASED THE FULL RIGHTS TO THE ARTWORK (THIS IS IN ADDITION TO SIMPLY PURCHASING THE ORIGINAL). THE COLLECTOR OR BUYER MAY NOT REPRODUCE THE ARTWORK IN ANY WAY WITHOUT WRITTEN PERMISSION. THE COLLECTOR HAS THE RIGHT TO DISPLAY THE ARTWORK IN THEIR HOME OR BUSINESS. ARTWORK MAY NOT BE RESOLD OR REPRODUCED FOR PROFIT IN ANY WAY WITHOUT THE ARTIST’S WRITTEN PERMISSION. COLLECTOR MAY NOT CHARGE ADMISSION FOR WORKS ON DISPLAY WITHOUT WRITTEN PERMISSION FROM THE ARTIST; ANY ADMISSION FEES MUST BE MUTUALLY AGREED UPON IN WRITING AND SHARED ACCORDINGLY. PLEASE LET HANNAH KNOW IF YOU ARE INTERESTED IN PURCHASING FULL RIGHTS TO A PAINTING.